As the city boasts, “Hartford Has It!” This silly slogan perfectly describes the Hartford area. As a New York resident, I had no idea what was in store for me when I moved to Hartford as a 1L. After two years of living in and becoming familiar with the area, I can confidently provide a list of all of the important places you need to know about to make the most of your Hart- ford experience. For the socialite: you can always find a good crowd on McLadden’s in West Hartford Center any night of the week. Also, the Half-Door is a UConn Law tradition. Right down the street from the law school, it often hosts trivia nights and music. Wednesday is $2 Irish Draft night – always a hit with the financially struggling law students in the area. In general, West Hartford Center has a ton of great places to out with your new classmates, including Bar Taco and The Elbow Room. Also, give the Shish Kebab House of Afghanistan a shot when you are not in the mood for a crowded bar. If you are looking to watch a game, head to Damon’s Tavern. For the foodie: You can get a decent meal at most of the restaurants in West Hartford Center and Blue Back Square – just make sure you are in your price range ahead of time. Downtown Hartford has a good selection too. Explore the restaurants in the area at your discretion. There are a lot of options for every food mood. One thing all foodies do agree on is dessert: AC Peterson’s will fulfill all of your ice cream sundae dreams. Bonus: On top of a good sports bar experience, Damon’s serves really good bar food. For the athlete: The area has gyms for every budget. Students frequent Wow Workout World for an incredibly fair monthly price. Anytime Fitness in Bishop’s Corner is open 24 hours a day – great for your busy schedule. There is also a NYSC in Blue Back Square if you are interested in an indoor swimming pool – and have a few extra bucks. The JCC in Bloomfield is also a popular option among students. For the yogi: West Hart- ford Yoga and Downtown Yoga have plenty of classes throughout the day to accommodate your schedule. Anytime Fitness and NYSC also offer yoga classes as part of their membership plans. LuLu Lemon in West Hartford Center provides complimentary yoga on Sundays at 10 a.m.
For the local: If you live or work near the law school, there are some amazing resources within walking distance. Tangiers International Food Market is about a 6-minute walk. It serves the best gyros in the area – a perfect quick lunch spot. Next door is a FedEx Kinkos for all of your copying and printing needs. And Tisane Café serves delicious coffee and pastries and is located just minutes from UConn Law. Obviously, make time for as many UConn sporting events as you can – especially at the XL Center down- town. You are a Husky now! Take advantage of your time in Hartford. It is a great place and has the benefits of both the suburbs and an urban center. From the perspective of a Connecticut plaintiff’s attorney, eating at Blue Plate Kitchen has something in common with winning treble damages from a major Connecticut insurer: Fresh, Local, and Sustainable. If you are visiting Blue Plate Kitchen for dinner it is worth your time to make a reservation. Don’t lose the consortium that the warm lighting, friendly staff, and locally sourced cocktails provide. The open kitchen and bar create a lively environment. There aren’t many decorations other than a bizarre wall of cereal boxes, but luckily its aesthetic charms don’t give rise to nuisance claims. Try the New England Side Car ($9) made with aged apple brandy from Westford Hills, Connecticut and New England cranberry bitters. The baby kale Caesar Salad was exceptional, significantly better than the standard Caesar. Most reviews focus on the main course but Blue Plate Kitchen’s side dishes stood out as excellently executed. The mashed parsnips ($4) were the star of the meal, revealing the vegetable’s subtly sweet caramelized perfume. Dinner Plates ($14-$18) came with an absolutely light and airy buttery brioche popover that was a close second. The only thing to avoid on their menu is the Simple Salad ($9). The farm to table vibe of the restaurant made me expect that “Blue Plate Kitchen Mixed Greens” would include garden cress, dandelion greens, or the winter-hardy mâche. Although it was mostly romaine, the vinaigrette was good enough to make up for it. You might hear your torts professor or Justice Cardozo saying, volenti non fit iniuria, no injury is done to a willing person (remember the Flopper? 250 N.Y. 479.). The professor would be right. I ate the whole thing. If there is a restaurant that you would like Adriene to review, please contact Pro Se. Address: 345 N. Main St. Bright orange, yellow, and green walls? Mexican food down the street from the Mark Twain House? Mariachi music? I can imagine Harriet Beecher Stowe’s emotional distress as she stands up and shouts “Outrageous!” Luckily today, the standards of civilized dining render the food at Monte Alban, 531 Farmington Ave., utterly tolerable in this civilized society. While I waited for the meal to arrive, I sipped on Aqua de Jamaica, a refreshing hibiscus tea and took in the atmosphere. Pictures of the Mexican countryside hang on the colorful textured walls, accented with hand painted tiles. I loved how the lanterns and terra cotta tiling that formed arched doorways made me feel like I was in a hacienda’s courtyard. There was an inviting patio with a fountain but sadly they’ve closed it for the winter. I made a mental note to come back in the spring. Served on plates that matched the walls, the gorditas were to die for: juicy chicken stained red with spicy peppers and tomato stuffed in a fluffy cornbread pita. I had to force myself to stop eating them to try the tamales, steamed in soft corn husks. Hot and earthy, they were the perfect comfort food. The tostada looked delicious: curvaceous slices of vividly green avocado surrounding a mound of sour cream covering pico de gallo, shredded chicken, and beans. Monte Alban’s Chimichanga, a deep fried burrito, suffers a design defect. They should be crisp and crunchy but Monte Alban’s was soggy, soaking in a salsa that lacked dimension. In Monte Alban’s defense, the state of the art in this part of the country is to drench burritos in salsa. I prefer picking up a burrito in my hands like they do in Southern California. Nevertheless, served with a corncake, rice, and beans, it is a generous portion. My favorite entrée was the Al Pastor Burrito made with dry rubbed spiced pork, a good change of pace from the typical shredded chicken and ground beef that dominates Monte Alban’s menu. I recommend Monte Alban. Its location makes it the perfect place for lunch. Not only will you get good food but you will support a local business near the Law School. After a rocky start, Fleming’s, located in West Hartford, debuted a new menu that raised the steakhouse-dining standard of care to new heights. Sadly, the chilled seafood tower disappointed. Good wine elevates quality ingredients and reveals poor ones. The shrimp was partially grey and mealy. The attractive heaps of crab legs and lobster tail floated high above the table in a metal stand. I had to strain to see it, much less to eat it. However, judging a steakhouse on seafood is practically negligence per se. Next was a salad tossed in a whole grain mustard vinaigrette, topped with crisp pork belly, and paired with a delicious white burgundy by Olivier Leflaive of Meursault. Chef Christian Schunmann achieved a brilliant balance with delicate slivers of red onion, fennel, and orange, providing the perfect foil for the pork. It is a testament to the composition of the salad that the burgundy was a welcome but unnecessary addition. The salad is not yet officially on the menu, but I hope that it will be soon. A new option is a dry-aged steak, which has a more robust and nuttier flavor than the common wet-aged steak. 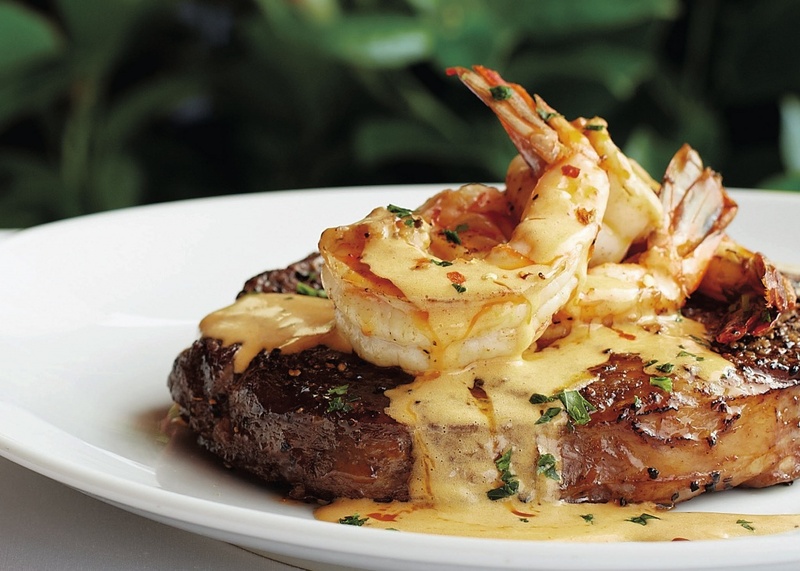 Many people disdain steakhouses, thinking that anybody can cook a steak. 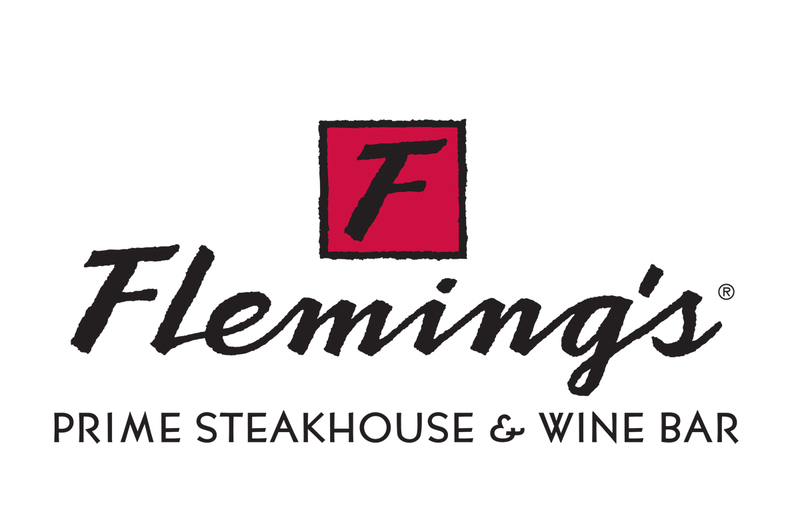 They need to try three of Fleming’s Steak Companions: truffle poached lobster with caviar, king crab in herb butter with caviar, and a charming sweet onion bacon jam. These toppings complemented but did not compete with the steak. Too often a steak topping masks the meat. This was the case with the Diablo Shrimp. The excessive spice made the steak superfluous and overwhelmed my palate. The Round Pond Napa Valley Cabernet Sauvignon paired beautifully with the steak, crab, and lobster but could not hold up to the Diablo Shrimp. Potatoes au gratin, asparagus, and cipollini onions, much like the leather upholstery and dark wood paneling but better tasting, made the place feel like a great steakhouse. Fans of marshmallows should try the Cappuccino S’more – decadent and well done with homemade marshmallow covering a graham cracker coated chocolate lava cake. I found myself mining eagerly through the sticky mire to reach the thick pool of chocolate beneath. Like the salad, you might have to ask for this one if it has not been officially added to the menu. Finally, Fleming’s has introduced the “Wine Pad”. The iPad wine-list lets you easily browse their extensive selection, but replacing a human sommelier with an iPad would almost certainly breach the standard of care people expect when visiting a restaurant with prime steaks, real linens, and delicate stemware. Go to Fleming’s for a great meal when you miraculously get an A in Civil Procedure, pass the Bar, or land that summer associate position. If you want to be a trial lawyer and are feeling aggressive, go for the Old Vine Zinfandel “Predator” and the tableside carved bone-in “Tomahawk” steak, but save the $985 bottle from Harlan Estate for when you are elected to the senate, made partner, or raised to the bench. If there is a restaurant you would like to see Adriene review, please contact Pro Se.